Codes & Essential Referenced Standards. Now available in a searchable, online library. must have reasonable access to standards. Reasonable access means that plan reviewers and inspectors of the enforcing agency must have practical access to the standards to properly enforce the code. It is suggested that hardcopy books be within 100 miles of the local jurisdiction. *According to Stille-Derossett-Hale Single State Construction Code Act, 1972 PA 230 and Section 8b(6) of 1972 PA 230. We've created an enrollment form which you can customize with your Chapter's information. 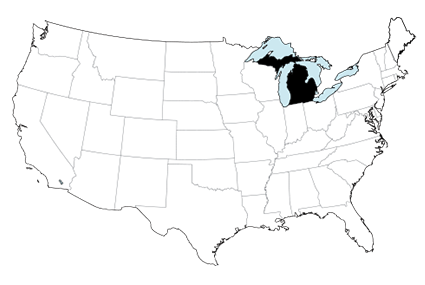 Send it to your jurisdictions, collect the proper information, and MADCAD will provide a quote based on your Chapter's needs. Building a hardcopy library is costly and inefficient. Building a hardcopy version of our proposed package would cost around $10,000 for one set in one location, and only one person would be able to access a book at a time. Sharing a hardcopy library with other jurisdictions would cut costs, but would require time and money to travel in order to view books. Gaining access to a university or professional library would cut costs, but requires dependence on another entity. Rather than buy hardcopies, jurisdictions can save costs by grouping together and sharing an online library. All authorized users will have access to all codes 24 hours a day, 7 days a week. With online access comes many other benefits. A cloud-based library means you can access your library from anywhere - your office, home or the construction field. Lower costs by sharing your account across several jurisdictions. Any number of users may within authorized jurisdictions may access the library. Access your library from your smart phone or tablet from anywhere, as long as you have an internet connection. 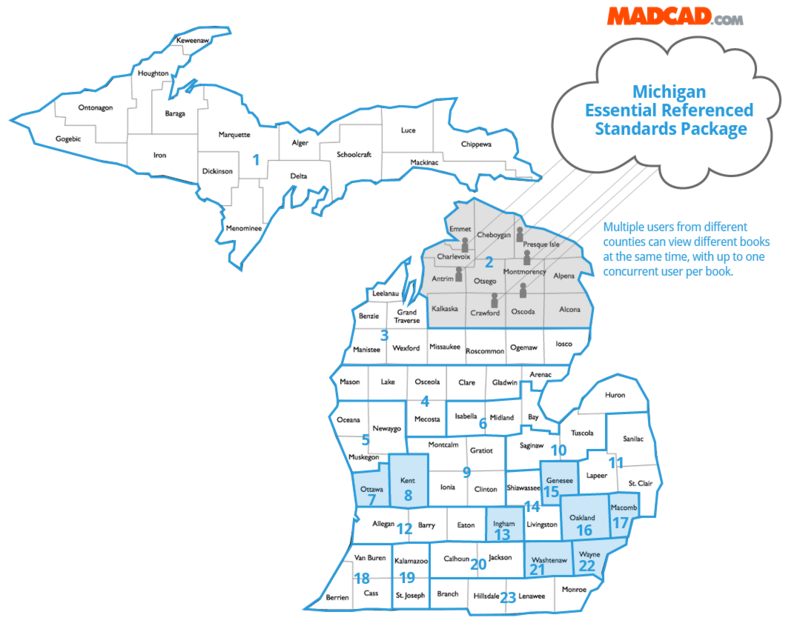 We've created a special collection which includes a total of 224 titles - the most essential referenced standards in the Michigan local codes and standards. Share your online, cloud-based library. We've created the groups below by analyzing populations and construction costs. Each group has a population of approximately 300,000, with the exception of jursidictions shaded blue, which have populations above 300,000. We've created two MADCAD.com packages designed to fit these groups, with examples detailed below. Example: Group 2 has a population of 311,000* with construction costs of $153,000,000**. This group includes 160 jurisdictions within 12 counties: Alcona County, Alpena County, Antrim County, Charlevoix County, Crawford County, Cheboygan County, Emmet County, Kalkaska County, Montmorency County, Oscoda County, Otsego County and Presque Isle County. If a single jurisdiction were to buy 1 hardcopy set of standards, the cost would be over $10,000. By sharing online access amongst counties, costs are brought down to $9,000 total for all jurisdictions together. This package includes 224 codes and standards and allows users from different jurisdictions to share access, with one concurrent user able to access each title at a time. If some titles are used more then others, it is possible to add more concurrent users to specific titles for an additional cost. Example: Group 8, Kent County, has a population of 600,000* with construction costs of $242,000,000**. Due to a higher population and higher rate of growth, there will be more code officials and building permits given, thus we've created a package which includes 224 titles with more than one concurrent user for specific titles. * Population figures are based on the 2010 US Census. ** Construction costs for Housing Units Authorized by Building Permits data is based on the 2007 US Census. Upload your local documents for free. Quoted prices are estimates. For more details and accurate pricing tailored to your specific needs, please contact Erdem Dedebas at +1 202.265.1940 ext 207. or info@madcad.com.